Cross Media Publishing and Media Convergence have become the most talked about terms for the publishing industry. Newspaper executives and journalists need to equip with the knowledge and skills to successfully develop and implement a media convergence strategy in this competitive environment. 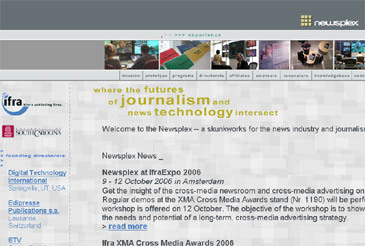 Join us for the 2 days workshop in Kuala Lumpur on Nov. 6 - 7, 2006 and learn from our Ifra Newsplex trainers, the 'best practice'examples, models for convergent journalism, process management and organization, change management and the use of new technologies. — To identify the major aspects of convergent journalism, publishing and newsroom trends around the world. stressful challenges facing the newsroom management today. Please sign up before 29 September (Friday) to enjoy the Early Bird fees. Should you need further clarifications, please do not hesitate to contact us at Ifra Asia.